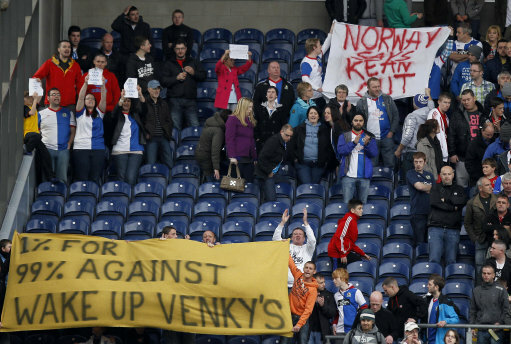 Anti-Steve Kean protests have almost become part of the Premier League experience at Ewood Park this season. With the club currently struggling in 18th place in the table, and having won just six league games out of 31 under Kean’s stewardship, Rovers’ fans are desperate for a change. However, ahead of Saturday’s fourth successive fans’ protest, the club have decided to ban people from unfurling banners calling for Kean’s dismissal either before or during Blackburn’s game with Chelsea. Apparently the club is concerned that the protest may provoke a counter-demonstration which could lead to trouble. To their credit, Blackburn will allow the protest to take place once the game itself is over (and most of the TV cameras are gone, presumably?). oh yeah, we know that counter-demonstration would be huge! rabid pro-kean supporters would see these banners unfurled and immediately go on the attack. flares would be thrown back and forth, seats would be ripped up, it’d be bedlam i tell you. ABSOLUTE BEDLAM! All blackburn rovers fans should be able to see a football match with there protest banners if the venkys dont like it tough luck. a non attendance protest would show the owners that something has to be done very very quickly.the game against west brom for e.g. as a season ticket holder for decades it would be hard not attend a home league match but it would i think be affective.